The MPLAB Xpress ecosystem features many examples that are there to be reused in your own application or simply serve as a reference. Examples are posted by the Microchip Technology and members of the MPLAB Xpress community. Once you are comfortable with the IDE and associated tools you are encouraged to post your own examples to help grow the community. 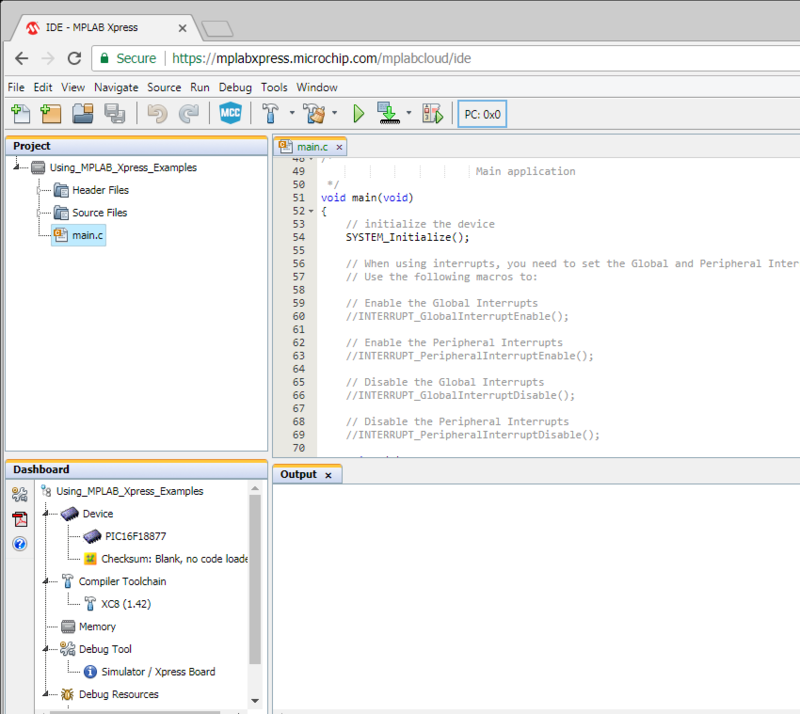 This post will demonstrate how to search through the example database, open a selected example in the MPLAB Xpress IDE and then download the example to an MPLAB Xpress Development Board. Although this post uses the PIC16F18877 device and associated development board it is applicable to all devices. Simply substitute the device you are using whenever you see the PIC16F18877 in the documentation below. and click on the examples link at the bottom of the page under the “Community” heading. Device: The particular device being used. In this example the PIC16F18877 is used. The device name populating a given MPLAB Xpress Development Board can be found next to the board’s USB connector. 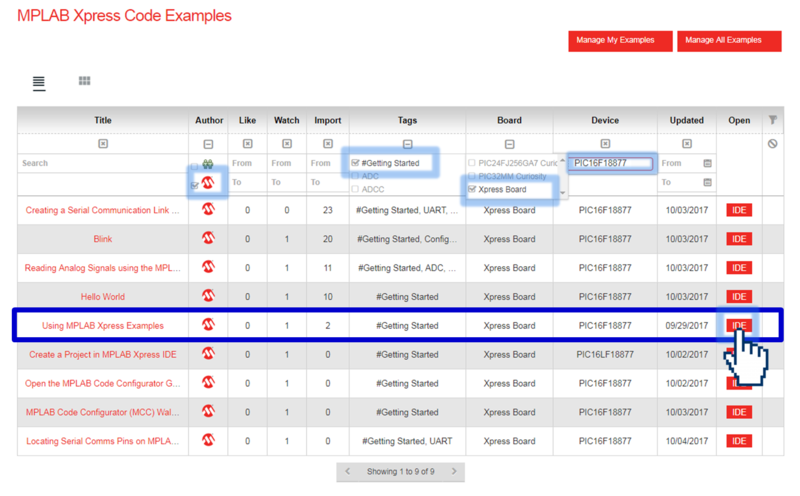 Scroll through the available examples and locate Using MPLAB Xpress Examples. A description of the example along with any additional resources which could include videos links to step-by-step tutorials and more can be accessed by clicking on the title of the example. 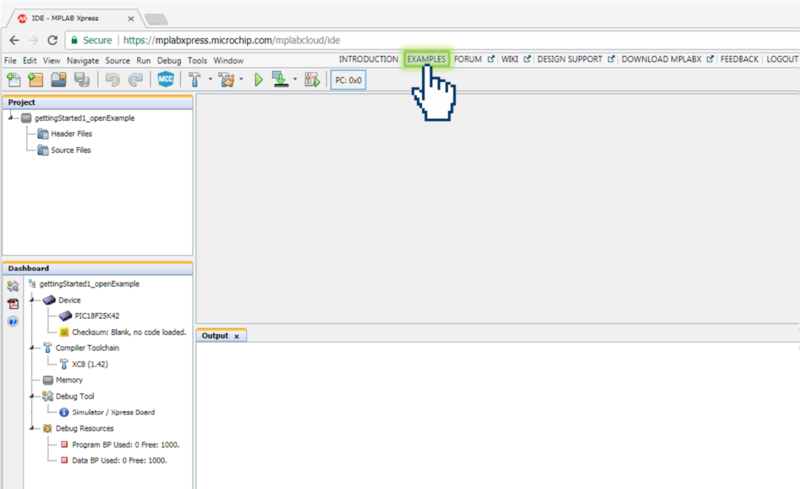 Open the example inside of the online MPLAB Xpress IDE by clicking on the IDE button in the open column. Once open, the IDE will present all source code along with information related to the development tools and device that the project was configured to use. Connect the MPLAB Xpress Development board to an available USB Port on the computer. Once connected and the device drivers have completed installation, the MPLAB Xpress Board should be recognized as a Mass Storage Device on the Host Computer and listed as an available drive (Windows® Explorer shown here). Click on the Make and Program Device button at the top of the MPLAB Xpress IDE to generate and download a .hex file that will be used to program the PIC16F18877 Microcontroller populating this particular MPLAB Xpress Development Board. In some browsers the generated .hex file may be available within the browser window or may need to be accessed from a “Downloads” folder associated with the browser. Navigate to the downloaded .hex file and drag onto the XPRESS directory shown in Step 4. Once the Using_MPLAB_Xpress_Examples.hex has been dragged and dropped into the XPRESS directory, the LED on the MPLAB Xpress Board will briefly flash red indicating that the PIC16F18877 is programmed. In this example a FREE program called CoolTerm is used. Note that the COM port number will vary from that shown below. 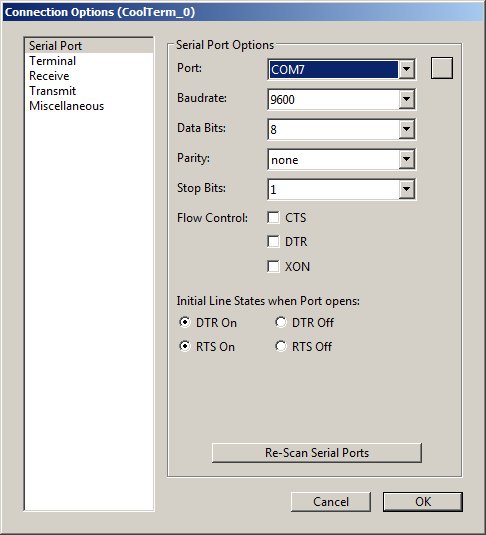 If using CoolTerm, open the Connection>Options… dialog and configure the serial port at the 9600 baud rate that was configured earlier in the project when configuring the EUSART in MCC. Inside of the terminal window click on the Connect button to establish connection with the Xpress board.